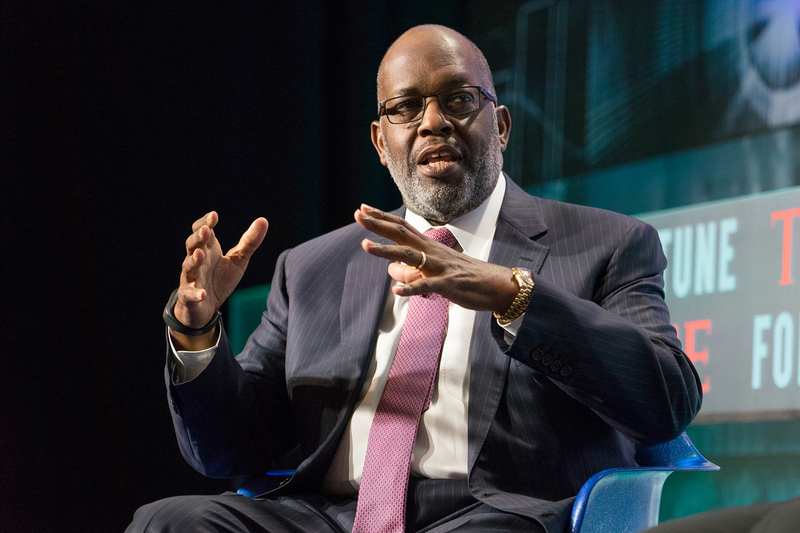 Kaiser Permanente CEO: A Bipartisan Health Bill Is The Way To Go : Shots - Health News If Republicans and Democrats work together to solve a few critical challenges in the health insurance market, it will stabilize, says Kaiser Permanente Chairman and CEO Bernard Tyson. Bernard Tyson, CEO of Kaiser Permanente, is optimistic about a bipartisan health bill. He cautions that partisanship will only lead to more insurance instability. That's the sentiment of Bernard Tyson, chairman and CEO of Kaiser Permanente, which provides health care to 11.8 million members in eight states and the District of Columbia. Tyson talked with Morning Edition host David Greene this week about what a health care compromise could look like, and how to get there. Tyson dismisses the idea that the insurance exchanges created under the Affordable Care Act, also known as Obamacare, are collapsing. While he acknowledges that there have been challenges because of the uncertainties of what requirements will be included in the program next year, and sees the system as vulnerable, "as of right now, no, it's not close to collapsing," he says. "I believe strongly that if the government solves a few vital areas, insurers who got out of the market will get back into the market," he says, referring to insurers that have pulled out of the exchanges, or threatened to for 2018. One way to get better decisions about health insurance is to put it in the hands of state governments, Tyson says — which is what Republicans have been focused on. "That said," he adds, "there should be some rules of the road, which are the guardrails — as in the Affordable Care Act." The "guardrails" could be federal standards for things like preventive care, maternity care and hospitalization, he says. "There have got to be, in my view, some guidelines so everyone is clear about the threshold requirements across the country," Tyson says, "given that we're trying to solve a societal issue, which is [that] millions of Americans are still locked out of the front door of the American health care system." He sees room for compromise — agreeing to some federal standards, but also offering states a degree of flexibility in how to best allocate some health dollars to certain health issues. For example, states might know best about how to direct money to fight the opioid epidemic, he says; that could vary by region. Tyson says a compromise on the health law can happen "as long as Republicans can agree that what we don't want to do is end up with modifying the law [in a way that] people will lose access." He cautions that partisanship will only lead to more insurance instability. "I think the reality is that the Affordable Care Act was enacted based solely on the Democratic side of the house," Tyson says. Now, "to those who believe the ACA is a 'disaster' that we will solve by coming up with another partisan solution — that's not good for this country." Morning Edition's Tony Liu, Jessica Smith and David Greene edited and produced the audio version of this interview.